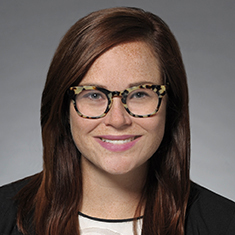 Alexandra McNicholas focuses her practice in litigation matters. Prior to joining Katten, Alexandra completed a Public Interest Law Initiative fellowship with Northwestern University's Bluhm Legal Clinic Center for Criminal Defense. During law school, Alexandra served as a vice president of the Chicago-Kent Moot Court Honor Society and as a notes and comments editor of the Chicago-Kent Law Review. Additionally, Alexandra externed for the Honorable Ann Claire Williams of the US Court of Appeals for the Seventh Circuit and for the Honorable Elizabeth Budzinski of the Circuit Court of Cook County. Before attending law school, Alexandra worked as a corporate paralegal at both a law firm and a hedge fund.